Canada has a long standing relationship with graffiti. This particular brand of street art can produce beautiful murals, but it can also mean unsightly tags or offensive designs. Whatever the nature of your vandalism, our Gorillas can get rid of it for you. A professional Surrey graffiti removal not only removes spray paint but any overspray and shadowing associated with stains. One of the major reasons that graffiti is as common as it is, is the ease of use of aerosol paint. Spray paint is sold at just about any hardware or department store, is easy to carry and takes only a finger to use. This accessibility means that just about anyone can be a street artist. Graffiti comes in all shapes and sizes but the most common forms are tags. Tags are small letters or designs that act as a signature. No matter how small or innocent, these signatures might be, you don’t want them ruining the look of your home or business. 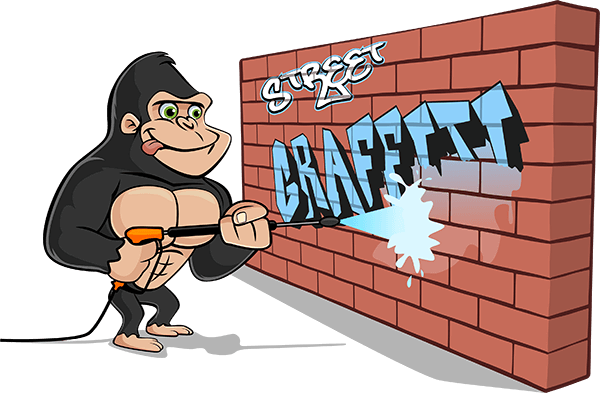 Here at Gorilla Property Services, we employ two White Rock and Surrey Graffiti Removal technicians. Technicians split routes into two groups. These are North Surrey Graffiti Removal and White Rock/South Surrey Graffiti Removal. These routes cover the Scott Road and King George Highway/Boulevard, Old Yale Road and the 152nd area including Fraser Heights. In South Surrey, areas experiencing frequent tagging include the downtown core, around 16th Avenue, North Bluff Road and the beach community of Marine Drive. Surrey is one of the fastest growing cities in Canada, with a population of almost half a million people. You can imagine this keeps our Surrey Graffiti Removal team active! Surrey is blessed with beautiful tourist sites such as Bear Creek and Tynehead Park. Then there’s the historical pier and beach area of White Rock, drawing visitors from all over. Gorilla Property Services strives to keep these and other areas graffiti free.